Tina Mavrelis-Charalambous is a mom of three children. Having had her son later in life she longed for a facility in her own neighborhood of Astoria. "I have lived in Astoria all my life and there was not a place designated especially for children"
Tina's vision was to provide a clean, safe, nurturing, welcoming facility for families in Astoria! That's when her vision came to reality! having looked at many spaces in Astoria she fell in love with her location. "This is the space" Having opened in 2010 she was a pioneer that many admired and respected. "I love children and wanted a place where they could call a second home!" Having been raised by Greek immigrants she knew how important "Gym-azing" would be to the community. "I support all neighboring schools, give donations, donate space for events and meetings, also doing school fundraisers." 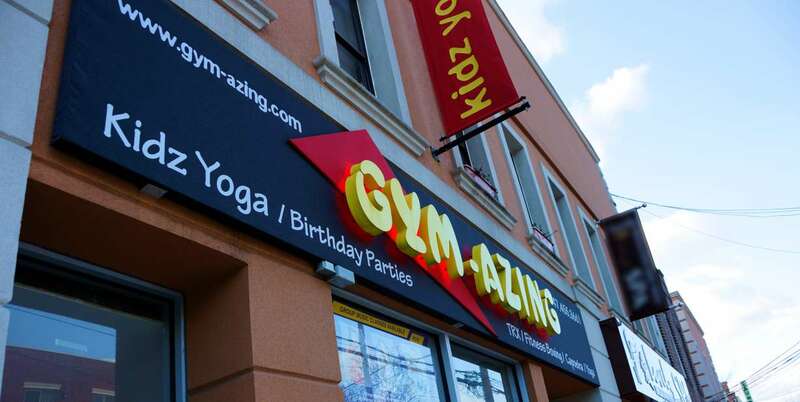 Gym-azing offers a wide variety of kids classes. From Music Together, SocRoc toddler soccer classes, Abrakadoodle art classes, Long Island City Academy of Music offering small group piano classes. Also offering Ballet, Jazz, Zumba, Greek dance, Yoga and Capoeira. WE also offer children's birthday parties. We offer parties for children of all ages. From those very important 1st Birthday to specialty parties for older children. December 2014 we introduced our "Glamour Girlz Spa Party". We are the only one offering girls spa parties in Astoria! Tina also is certified in TRX group suspension training, having over 20 years of fitness experience. "I love training and challenging women" TRX is a great full fitness excersise that will never bulk the body but will help achieve long lean muscles. Small group classes or personal training is offered!Zumba is offered on Tuesday and Thursday nights at 7. Adult Greek Dancing on Tuesday nights at 8. "We have something for everyone here at Gym-azing!"